Videx, Inc. is an industry leader in the design and manufacturing of the award-winning CyberLock keycentric access control solution. For over a decade, Videx has been supplying CyberLock to security conscious clients in over 50 countries around the world. If you are looking for an access control solution that is versatile, easy to deploy, and affordable, contact Videx today - you won't be disappointed. CyberLock is an electromechanical access control system that is designed to increase security, accountability, and key control throughout your organization. No complicated wiring or other intrusive construction work is required and you can continue to use your existing door hardware. 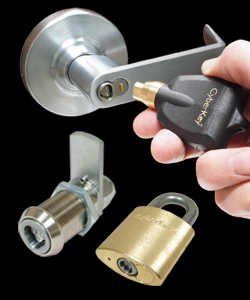 CyberLock cylinders and padlocks are high quality locks that are built to perform in both indoor and outdoor environments. They are designed for applications where high security is required, such as for construction equipment, remote storage areas, trucks, storages bins, and more. With no pick-able keyway and options for increased security features such as drill resistance and key retention, CyberLock can quickly provide increased security - no matter the location. Control Access to Every Lock - And Never Re-Key Again! Re-keying a facility every time a key is lost or stolen is time consuming and expensive. CyberKey smart keys are programmed by the software with access permissions for each user. Keys work only during specific hours, and only for the locks each person is allowed to access. These intelligent keys cannot be duplicated, eliminating the need to re-key a facility. CyberLock electronic locks and keys provide accountability by auditing openings and unauthorized entry attempts. Keys can be programmed to allow or restrict access to different parts of the building. 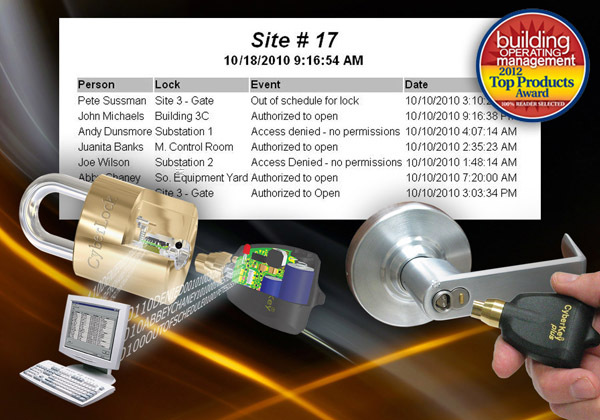 The information stored in the key and the lock can be transferred to a computer to provide precise audit trail information about where and when each lock has been used including the date, time, and whether access was allowed or denied. The innovative CyberLock design consists of electronic lock cylinders that receive their power from the battery in the CyberKey. This allows the system to be installed and operated with no need to hardwire the building. A majority of CyberLock customers install CyberLock cylinders in the original door hardware on the existing doors. This makes installation fast, self-contained, and straightforward. Every business, whether large or small, has assets that need protecting from both internal and external threats. Traditional door-based access control solutions address the most obvious security requirements. However, protecting assets that reside in beyond-the-door locations often get overlooked. In response, Videx has designed over 280 different electromechanical lock cylinders for cabinets, cash boxes, trucks, gates, narcotic boxes, safes, vending machines, cell tower sites, traffic control boxes, server cabinets, doors, and more. CyberLock delivers all of the benefits of traditional access control tailored to your exact requirements and provides all the security, convenience, and control required. 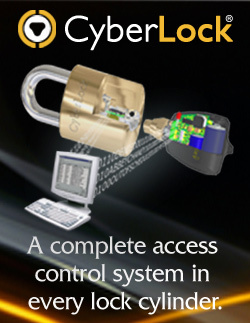 Want to know more about how CyberLock can help meet your access control needs? Contact Videx today! SecurityStockWatch.com: Thank you for joining us today, Jim. Please give us a brief company history and an overview of your background. Jim McGowan: Videx is an electronics and engineering firm based in Corvallis, Oregon, that has been designing and manufacturing industry leading products since 1979. In the spring of 2000, Videx introduced CyberLock, a product so innovative that it was immediately recognized by the security industry as an exciting break-through in electronic access control technology. CyberLock has since been honored with many national and international “product of the year” awards. I joined Videx in the spring of 2010 after 10 years of helping California-based high tech start-up companies get off the ground. What drew me to Videx was the CyberLock product line. Here is a proven product, with 10 years of development under its belt and yet CyberLock remains early in its product cycle. Our true growth phase is just beginning and it brings with it that same start-up excitement and energy without the typical growing pains associated with launching a new product. SecurityStockWatch.com: What are the latest developments at Videx? Jim McGowan: Videx recently released the CyberLock Flex System family of products that affirms our companys reputation as a driving force in the development of next-generation access solutions. The new products not only expand the flexibility of the CyberLock access control solution but they establish a foundation that allows for significant future expansion in the security industry. SecurityStockWatch.com: What sets the CyberLock Flex System apart from other access solutions? Jim McGowan: Videx is well known for the key-centric CyberLock System of electronic lock cylinders and programmable keys. With the introduction of the CyberLock Flex System, we have taken the basic functionality of the CyberLock System and added the ability to communicate with a wide variety of access solutions. There will be significant future module expansion to support Wiegand input and output devices, alarms systems, and existing hardwired door control systems in the third and fourth quarters. We have only begun to expand this system's capabilities. SecurityStockWatch.com: The Videx website, www.videx.com, states, “CyberLock is an access control system that increases key control and accountability throughout your organization. Based on a unique design of electronic lock cylinders and intelligent keys, CyberLock solves security problems that no other system can.” Please give us an overview of the Videx value proposition and product line. Jim McGowan: Videx is known for introducing revolutionary technology and innovative products to the security market; the CyberLock product line is a prime example of that. If you have ever spent much time looking for access control products you will find systems that are fundamentally the same (i.e. presenting a RFID card or PIN to access secure locations). Basically, there is a passive key opening a smart lock and in order for that lock to work the door needs to be wired, which isn’t cheap. CyberLock is different in two fundamental areas. The lock requires no power or battery; instead it is energized when the key touches the lock. Secondly, the intelligent key carries the user’s access schedule so it knows what locks it can and cannot access. Essentially, Videx has reversed the concept of the smart lock. This enables us to produce a very small electronic lock cylinder that can be installed in existing door hardware. The CyberLock product line is a scalable system that is made up of four components: CyberLocks, CyberKeys, communicators, and CyberAudit-Web software. Each of these components provides a specific functionality within the system to increase security and accountability. The CyberLock cylinders replace standard mechanical lock cylinders and don’t require wiring, power, or batteries. The locks store all access events in memory, both granted and denied, and can be interrogated in the event a key is lost or stolen. The CyberKeys store the key holder’s access control permissions as well as information about which CyberLocks the user has accessed or attempted to access. The communication devices act as the conduit between the CyberKeys and the CyberAudit-Web software. The communicators re-authorize the CyberKey schedule of permissions while simultaneously downloading recorded events from the key’s memory and transferring all of the information to the database on your computer. The wide variety of communicator options we offer enables our clients to choose the devices that provide them with the best balance between convenience and security. Finally, the CyberAudit-Web software is the intelligence behind the entire CyberLock system. There are three levels of software which offer a wide range of management tools to accommodate every type of installation, from small single location businesses to multinational corporations. CyberAudit-Web software can run on any of the three main operating systems in the world: Windows, Mac, or Linux. SecurityStockWatch.com: With a company history of more than 30 years and a focus on the design and manufacture of cutting-edge access control products for more than 10 years, Videx is certainly a pioneer in the physical security/access control space. What are your key target markets and what is your perspective on the market drivers for Videx solutions during this challenging economic time? Jim McGowan: Right now, times are tough and companies are looking for ways to increase security and save money. CyberLock provides a cost effective, economically sustainable access control solution for establishments that historically have had to re-key their facilities due to lost or stolen keys. There are two markets in particular where we have had great success. The first market is defined by any customer who needs to secure and track access to facilities and locations outside traditional buildings. Since CyberLocks do not need power, they are ideally suited for gates, off-site storage facilities, containers, truck cargo bays, etc. The second market is customers who need all the benefits of an electronic access control solution but can’t afford to spend $2,000 to $3,000 per door to install a key card or prox card solution, nor are they prepared for the infrastructure disruption associated with a wired-in system. CyberLock, on the other hand, is easy to deploy in a build-as-you-grow strategy. It does not disrupt normal business operations, negatively impact the architecture of historical buildings, nor break the bank when implemented. SecurityStockWatch.com: Congratulations on the ISC West 2010 Awards regarding CyberKey Vaults. What are the solutions this new product introduction brings to market? Any new products or developments you’d like to mention? Jim McGowan: Over the last ten years Videx has taken pride in the fact that we have been on the cutting edge of new product development in the security industry. We have done so by listening to our customers’ needs and continually developing products that incorporate a wide variety of customer-friendly features. We have set ourselves apart from the competition by having the ability to take a product from concept to prototype in days versus weeks or months. The CyberKey Vaults were produced based on a common concern we heard from our customers. Many companies expressed to us that they don’t want their employees or subcontractors taking keys home and they do want to control access to the keys and track key usage. With the CyberKey Vaults we were able to create a solution that enables our customers to store CyberKeys on location. The CyberKeys can have multiple users since the keys are left in the vault un-programmed until an RFID card or identification number is used to open the vault, at which point a key is programmed with the user’s access permissions. Once the key is returned, all the information is downloaded and the key goes back to an un-programmed state. We are very excited about our future as we have several projects underway. We released modular versions of our CyberKey Vaults this spring as well as a number of enhancements to the overall CyberLock system that will enable seamless integration with other security platforms. SecurityStockWatch.com: We read with great interest about the Videx installations at Cleveland Transit Authority and at Atlanta-Fulton County Water. Can you tell us more about these success stories? Are there any other projects you’d like to talk about? Jim McGowan: The ITC Holdings deployment illustrates how the Videx CyberLock solution is helping electric power and transmission companies protect their physical and electronic assets that are spread out over broad geographic regions. ITC has taken great measures to maintain the integrity of their bulk electric system and protect it from vandalism and sabotage. The accountability and key control CyberLock provides enable them to minimize risks and meet government security standards for critical infrastructure. The Cleveland Transit Authority deployment exemplifies some of CyberLock’s best features. Since CyberLock cylinders do not need wiring they can easily protect mobile assets like the fare boxes in the Cleveland bus system. After deploying CyberLock, Cleveland Transit Authority saw their revenue collection increase dramatically and they realized a quick return-on-investment. Atlanta-Fulton County Water highlights how CyberLock can track and control access to pump stations, storage facilities, and well fields. The mechanical lock cylinders were easy to replace with CyberLock cylinders and the system enabled Atlanta-Fulton County Water to be in compliance with government mandates. Hoodview Vending is another case study that underscores how CyberLock benefits organizations whose security needs go beyond traditional perimeter doors. After Hoodview Vending implemented the CyberLock system on their vending machines, they quickly eliminated losses due to unauthorized key duplications. They realized a return on their investment within sixty days. They also found that CyberLock complemented the GPS system on their trucks, improving driver accountability and route efficiency. SecurityStockWatch.com: The Videx video (http://www.videx.com/cyberlock_videos.html) is truly excellent in educating your customers and potential new customers regarding all the features and advantages of CyberLocks and CyberKeys. What additional resources and support are available for end-users and the trade? Jim McGowan: We have published several case studies that illustrate how CyberLock has increased security and accountability for various markets including churches, schools, utilities, and more. You can find our Case studies, press releases, as well as product information. SecurityStockWatch.com: The trend of “convergence” of physical security solutions with network security solutions seems to have really worked in your favor as Videx is an electronics company making locks, not a lock company making electronics. Jim McGowan: As you said, we are not locksmiths, but we do understand security and the importance of providing a superior product to our customers. Where we surpass our competitors lies in the variety of products we offer in each category which contributes to designing a total solution for our customers. Since we have been in the key-centric electronic access control industry longer than anyone else, we have had many opportunities to refine the CyberLock solution based on real world experience and have expanded our product line to customers all over the world. SecurityStockWatch.com: Thanks again for joining us today, Jim. Are there any other subjects you would like to discuss? Jim McGowan: Thank you for your time. I just want to reiterate that your audience should keep their eyes on Videx as our CyberLock product line is expanding with a variety of new innovations in this year.